This black velvet designer dog collar is 5/8" wide. 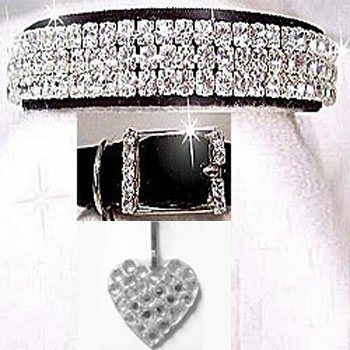 Sweetheart Diamond Collar has 3 rows of diamond clear Swarovski rhinestones. The stones are set in sterling silver plated prongs. It comes with the Swarovski crystal heart charm. This designer dog collar is Beautiful!